Humans have always been fascinated by the elegant birds. Their calls ring in the autumn the beginning of winter and announce its early end in early spring. a wintry tour led to the resting place of more than 100 birds in the Rambower Moor in Prignitz district in Brandenburg. South-east of the picturesque village Rambow in western Brandenburg the view opens into a wide plain. Reeds and shallow waters can be seen from afar. In between are tall grey figures in the wintry sun. 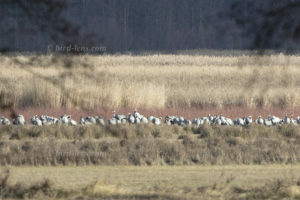 They are Common Cranes (Grus grus) resting here in the middle of winter. They stand out wonderfully from the gold-yellow of the reeds behind them. The birds can already be seen at a great distance. In Rambower Moor, up to 1500 cranes will gather for a nightly rest in March. Of course, it is much less now. Maybe it is still too early in the day and too sunny. 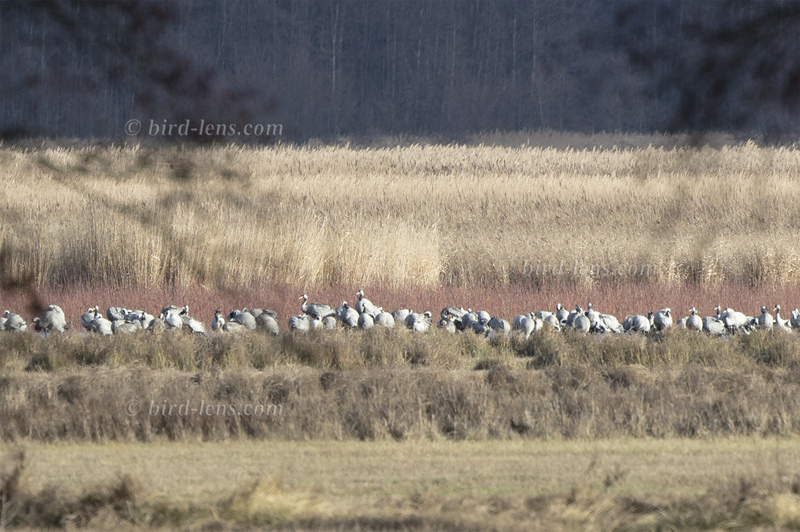 In good weathers Common Cranes spend more time on corn fields and come later to their resting place in the moor.